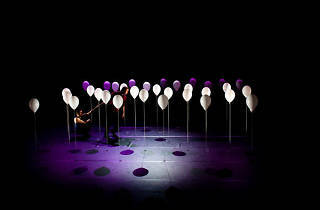 Surprisingly moving given the simplicity of its conceit, 'Lento', produced by the Finnish circus company Nuua, is a sad and dreamy piece: two performers move swiftly, almost frantically, amidst a throng of loose helium balloons, clutching at the trailing strings as if to prevent the balloons’ flight. One man is simultaneously ‘pursued’ by a smaller balloon, which flits about like a tiny bird on a leash, while the other seems to float himself, hovering almost weightlessly, in hesitation, like a balloon bouquet weighted with a stone. The two performers – Finnish-Brazilian duo Olli Vuorinen and Luis Sartori do Vale – choreographed the piece themeselves. 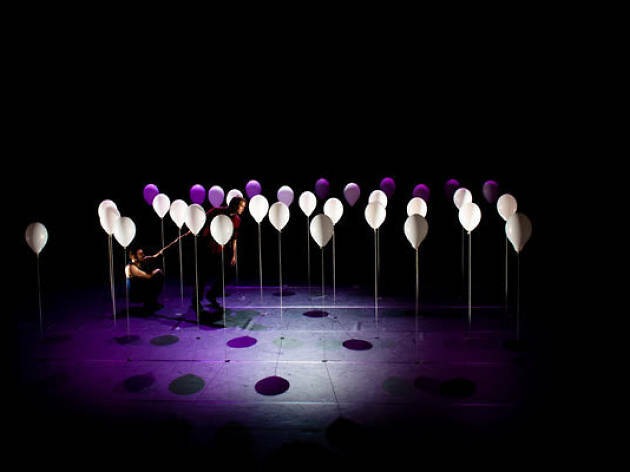 Consisting of a kind of zero-gravity juggling in which the two actors must work to keep their props earthbound (rather than airbound), 'Lento' is a feat of artful precision and coordination, a circus act with surreal emotional content.